The work of James Joyce has inspired many a musician—from John Cage to Kate Bush, and Lou Reed to Irish band Therapy?. The famed Irish writer was himself a great lover of song (his only collection of poetry is titled Chamber Music); most readers of Joyce know that he packed his stories and novels with thousands of allusions and quotes from popular and classical songs. All day I hear the noise of waters Making moan, Sad as the sea-bird is when, going Forth alone, He hears the winds cry to the water's Monotone. The grey winds, the cold winds are blowing Where I go. I hear the noise of many waters Far below. All day, all night, I hear them flowing To and fro. John Feeley, widely renowned Irish guitarist and arranger had a pleasure to play traditional Irish song " Corolan's Farewell" on the guitar which famous writer James Joyce was pictured playing on photo taken in Trieste by Joyce’s friend Ottacaro Weiss in 1915. Fewer know that if the encyclopedic modernist had not become James Joyce the heavyweight author, we might know him as James Joyce, singer and composer. Joyce once shared the stage with opera singer John McCormack and studied and performed music throughout his life. Joyce the singer is typically pictured “drooping over the keys” of a piano (as Shakespeare and Company founder Sylvia Beach put it). But he also played the guitar, as you can see from the 1915 photo above (taken in Trieste by Joyce’s friend Ottacaro Weiss). 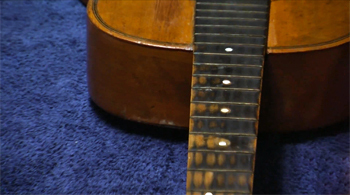 Joyce’s small-bodied guitar has been housed at the Joyce Tower Museum in Dublin since 1966, in an unplayable state. Now, English luthier Gary Southwell has undertaken a restoration of the instrument at the behest of Tower Museum curator Robert Nicholson and Fran O’Rourke, professor of philosophy at Joyce’s alma mater, University College Dublin. A musician himself, O’Rourke will perform Joycean Irish songs during Bloomsweek to offset the cost of the project, accompanied on the restored Joyce guitar by Irish classical guitarist John Feeley. The guitar which James Joyce was pictured playing in 1919 has been on display at Joyce Tower in glass casing for 45 years but no real care was given to it over the years. 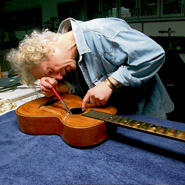 Professor Fran O'Rourke at UCD has orchestrated the careful restoration of the instrument by renowned lutenist Gary Southwell of www.southwellguitars.co.uk at facilities provided by Collins Barracks. The refurbished guitar will be played at a series of lunchtime recitals at Newman House in Dublin during Bloomsweek. Words and music by Joyce; Kevin McDermott, tenor, and Ralph Richey, pianist. The great poet's way with words is certainly apparent in this song's lovely and elegant lyrics. Sunphone Records, 1981.